Electric motors are used in a range of different appliances. From fridges and fans, to DVD players and fork-lift trucks, they are constantly converting electrical energy into kinetic energy using magnets and coils of wire. This works because the electricity creates a magnetic field inside the motor that can be used to create movement within the appliance. 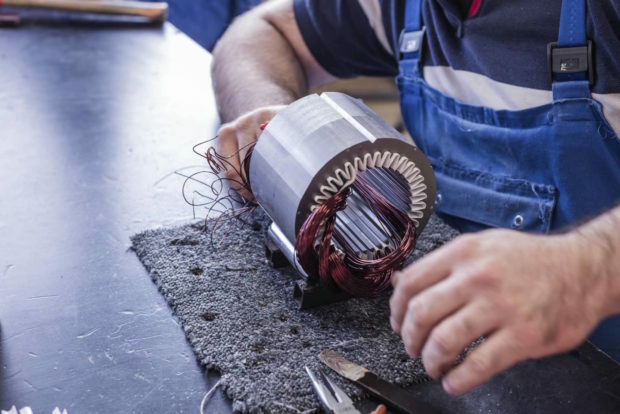 One of the most common problems with electric motors is that they get dirt on both the inside and outside which causes some of the components to stop working. Clean the outside of your electric motor using steel wool and soap. Removing any dirt and rust will allow you to see if there is any damage to the outside of the motor. This means you know for sure whether there is damage to the outside or your problem lies within. This might take a bit of work if your motor is older and in constant use, but the results should be easy to notice when the motor is looking sparkling new. Opening the electric motor is fairly straight forward dependent on what size and type it is. If it is a small kind used in fans and other small appliances then you should be able to leaver apart the casing (carefully) using a small blade. This should allow you to take a look inside and see the damage. Once you have removed the casing from the motor and pried apart the leaver and gears then the motor might also need to cleaning inside. This should be done with a lot more care than the exterior as you have to make sure you don’t break any of the components. Use tissues or cotton buds to clean in the tricky areas and then make sure that you do not let any soapy water inside the motor. You do not want it to be contaminating your magnets. Dependent on the type of motor there could be a number of things wrong with the motor. Whether it is the gear shaft, the magnet, the coil of wire or the commutator, locate the problem and replace. Be careful of any green goo on the inside that could potentially be harmful which is caused by copper sulphate being released. Don’t panic if it still isn’t working. Even if you have spent a whole day trying to fix the motor, there is still one solution and that is to buy yourself a brand new one. Bearing Boys have a huge range of electric motors perfect for a range of different appliances. This means no more tears over an unfixed motor. Instead you can spend your time cleaning the kitchen worktop before your wife comes home to find it covered in steel wool, grease and mechanical parts.